Home » Copiers » If You’re Not Investing In Printer Security, How Will You Afford to Pay for a Data Breach? If You’re Not Investing In Printer Security, How Will You Afford to Pay for a Data Breach? Today’s printers look a whole lot like PCs. They have many of the same hardware components as PCs, including disk drives, keyboards, and LCD control panels. This is true of firmware and software as well: printers have built-in operating systems, run executables, have DLLs, and run common protocols. Printers and MFPs are connected to the Internet and can be used to send emails. Today’s printer is a fully functioning client on the network. From the point of view of network security, printers require the same degree of protection as PCs. HP is leveraging the leading security technology in our HP PCs to make our printers even more secure. Our best-in-class features not only protect the device and the network from attack, but self-heal to keep the device running without IT intervention. Security issues aren’t limited to your computers and networks. Defend your network with the world’s most secure printing. 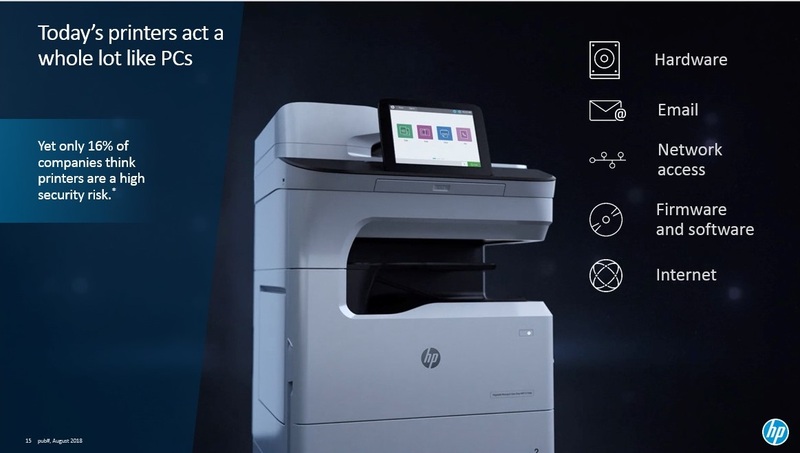 Only HP print security offers real-time detection, automated monitoring and built-in software validation to stop threats the moment they start. With HP, you’re more secure on every level, so the trouble that’s out there stays out. During start up. The boot code (for Pro devices) or BIOS (for Enterprise devices) is a set of instructions used to load critical hardware components and initiate firmware. The integrity of the code is validated at every boot cycle—helping to safeguard your device from attack. When loading firmware. Only authentic, good code—digitally signed by HP—is loaded into memory. If an anomaly is detected, the printer reboots to a secure, offline state and notifies IT. During run-time. HP embedded features help protect printers while they’re powered on and connected to the network—right when most attacks occur. HP devices detect and prevent unexpected changes to memory. HP Sure Start. If the BIOS is compromised, HP Sure Start forces a reboot and reloads with a safe “golden copy” of its BIOS. Run-time intrusion detection monitors complex firmware and memory operations, automatically stops the intrusion, and reboots in the event of an attack. HP Connection Inspector uses unique HP technology to evaluate outgoing network connections, determine what’s normal, stop suspicious requests, and thwart malware by automatically triggering a reboot. With the investment protection that upgradeable HP FutureSmart firmware provides, you can add some of these embedded features to many existing HP Enterprise and Managed printers. Part of good device security is making sure that your device is configured properly. The default settings on HP business printers are designed to make them more secure from the start. And HP JetAdvantage Security Manager plays a key role in keeping them secure. 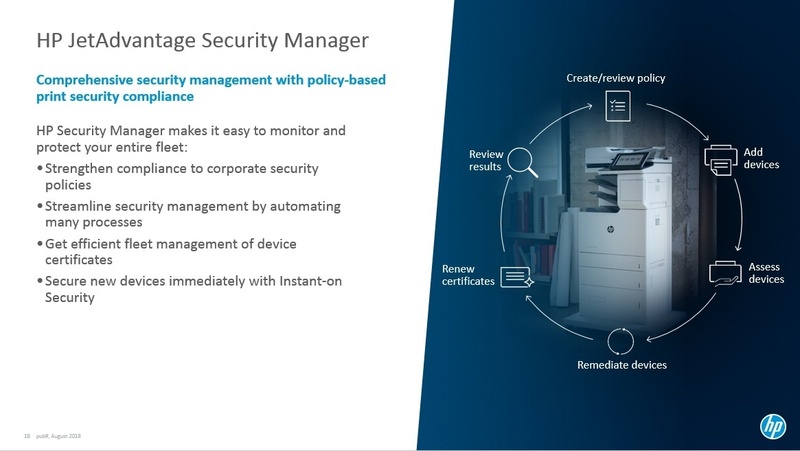 After a reboot occurs—or any time a new device is added to the network—HP Security Manager automatically assesses and, if necessary, remediates device security settings to comply with pre‑established configuration policies. IT managers can schedule regular Security Manager assessment/remediations, or manually launch one at any time. Ensuring proper device configuration not only helps protect your network and data, it helps you meet compliance regulations and avoid costly fines. Administrators can be notified of security events via Security Information and Event Management (SIEM) tools such as SIEMonster, ArcSight and Splunk. For comprehensive policy-based fleet security management, choose HP JetAdvantage Security Manager. It provides automated security monitoring of device security settings. It helps you increase security, strengthen compliance, and reduce risk across your printing and imaging fleet. It saves IT time by automating many processes. HP Security Manager offers a simple, intuitive process to establish secure settings across your fleet of printers, and automatically secures new devices as soon as they are added to your network. With over 250 settings on an Enterprise MFP, this process can save IT thousands of hours. HP Security Manager also provides efficient fleet management of unique identity certificates. The “Instant-On” feature of HP JetAdvantage Security Manager also checks and, if necessary, resets the device settings during a reboot—adding to the auto-recovery from an attack discovered by run-time intrusion detection or HP Sure Start. HP JetAdvantage Security Manager makes it easy to monitor and protect your entire fleet. Easily create a print security policy by leveraging the HP Security Manager Base Policy template. Use HP Instant-on Security to secure new HP devices as soon as they are added to your network. The software automatically configures settings to comply with your corporate security policy. 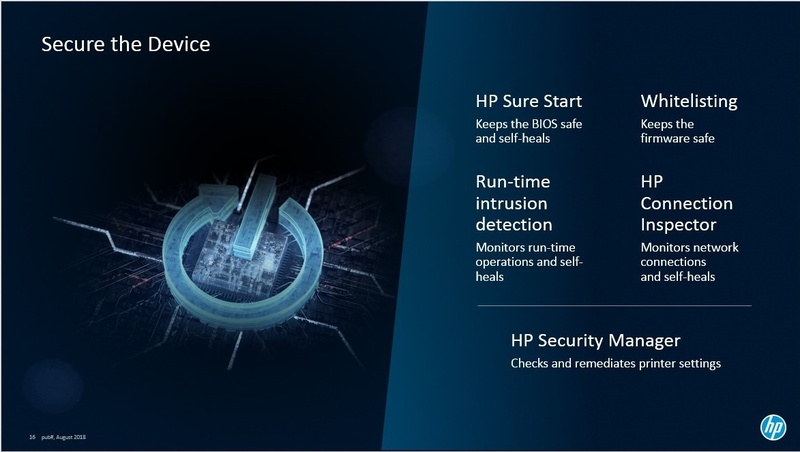 Configure HP Security Manager to automatically assess devices on a regular schedule, or launch an assessment at any time. The solution automatically remediates any settings that are out of compliance so all devices are compliant with your security policy. Another benefit is automatic fleet management of device certificates. The administrative overhead to install unique identity certificates across your fleet of HP devices is now less than manually installing on a single device. Actively maintain and verify compliance with your defined security policies by using HP Security Manager automated monitoring and risk-based reporting. When HP Security Manager is deployed with our Enterprise printers, our print security embedded technologies and software solutions materially “harden” our printers against known attacks. We can confidently say that we offer the most secure printers you can buy today. And, everything works together seamlessly to not only protect the network, but also make it easy for IT to administer. HP FutureSmart upgradeable firmware is a unique and powerful operating system that enables your HP enterprise printers, MFPs, and network scanners to be more useful and productive, today and well into the future. A great example of the investment protection FutureSmart can provide is whitelisting, run-time intrusion detection, and HP Connection Inspector. 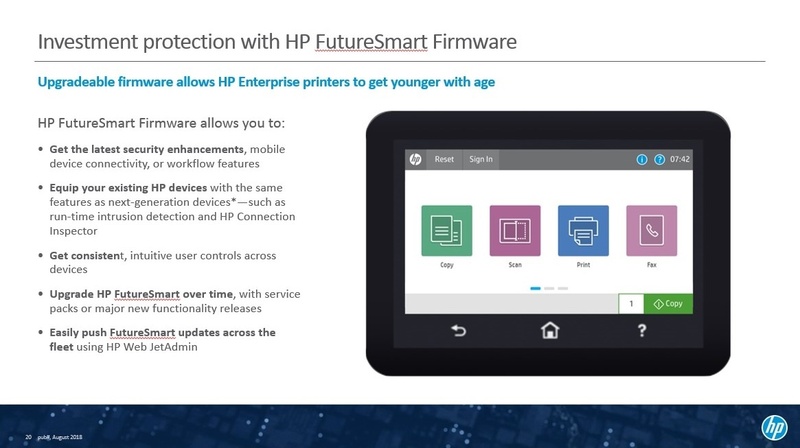 Most older HP Enterprise printers can add these features through a FutureSmart update. So you can get this breakthrough security technology on printers you already own. For more information or a print security assessment, contact us today. After placing a service call, it was indicated that I would receive the toner the subsequent day. The plant manager and myself were discussing the terms of the project when a representative of your company appeared. He was very professional in his demeanor. He displayed thorough knowledge of the task at hand. Not only did he replace the cartridge but provided maintenance to the laser jet, all the while not having to interfere with the meeting I was engaged in. I was so impressed with this young man's professional integrity that I asked him to sit down while I called you to thank you for a job well done. You know from a few instances that I had with your company that if the quality provided by your company I feel is lacking I will echo that sentiment.Its service like this that I enjoy acknowledging and give accolades where there is just cause, and why I look forward in doing business with your company for the years ahead. We have approximately 35 color/Black printers in mostly a production environment where downtime and poor print quality is totally unacceptable. Since going with Laser Line, their monitoring, repair and consumable services have saved my company thousands' of dollars, reduction in downtime,and machines that are constantly maintained. They continually provide recommendations for lowering printer cost and when purchasing/leasing new equipment. Maggie, our receptionist, also loves working with your customer service department. She said everyone is very courteous, reliable and the response time is incredible. Keep up the great work and we look forward to working with James and Laser Line for our printing needs in the future. 7-10-18: Wonderful customer service... I called and then stopped by their office with a Canon laser printer that needed an error code reset (P07) per 1-800 Canon.... serviceman explained all my options at no charge... I decided to go ahead and spend the $40.00 diagnostic charge just in case it fixed the problem well enough to go back home and plug in the printer and kick the can down the road on replacing it. In the end it worked! Worth every penny of the $40 for the expertise, understanding all my options and making the best decision for my situation without wandering around the internet for several hours wondering if what I was reading applied or not. Thank you Laser Line! Our primary call center staff no longer have to serve as a warehouse managers and delivery agents for the dozens of models of printer toner needed to support over 200 printers on our two campuses, nor do we need to have our second tier support personnel spending countless hours diagnosing printer failures only to eventually have to send the device out to a vendor for repairs.The time savings alone made this a very profitable solution for us but the other benefits are numerous. Your staff is pleasant and professional and the response time to clear a jam, change a print cartridge or just fix an aging printer has been remarkable. I don't believe we have ever waited more than a few hours at most. I would have many disgruntled employees if I ever decided to even try a new vendor. I just wanted to formally thank you for the work you and your team performed over the past couple of days. From ordering these printers (125+) through delivery and installation, you and your team were very professional, efficient, and courteous. Outstanding service!!!!! Michael is a great representative of your company. He told me of the company history and it is very obvious that he is proud to work at Laser Line. He was patient, respectful and friendly. He asked questions about how I use my printers to allow him to offer advice and support in addition to simply repairing this particular problem. He was genuinely interested in how Laser Line could support me. I will continue to recommend Laser Line to associates. Your focus on customer service really sets you apart.